Batik style originated in Indonesia and means drawing by using wax. This style of art has traveled the globe and found a home in Africa. Most batik scenes represent various aspects of life in Africa, past and present. These may include the daily activities of people such as carrying water, grinding corn, carrying firewood and shopping in the market as well as celebrations of life like dancing and musical festivals. The artist begins with a white cloth upon which s/he prints a design. Wax is then applied to the areas that will remain white. The cloth is then bathed in the dyes beginning with the lightest to the darkest all the while applying a layer of wax to separate the colors. By the end of the process the cloth will be completely covered in wax. To remove the wax, the artist crumples the cloth and then uses an iron to remove the final remnants. 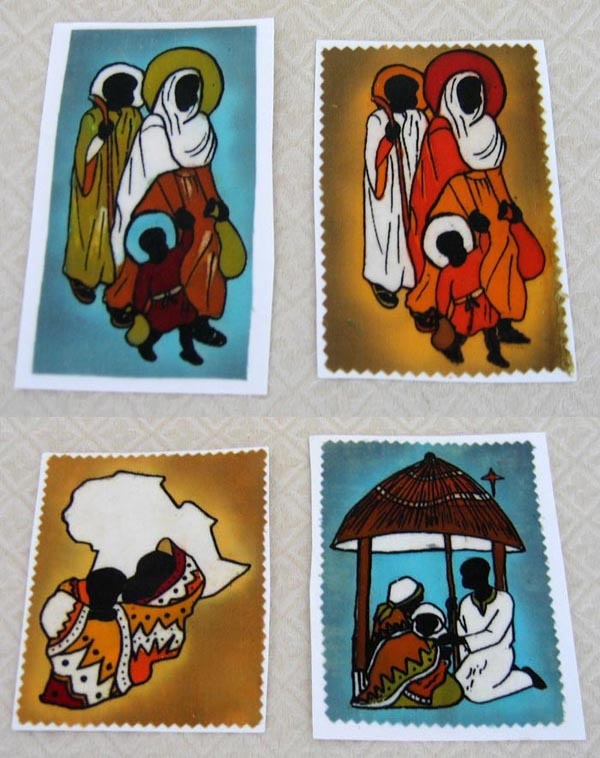 These four cloths from Kenya depicting the Holy Family, Madonna & Child, and the Holy Family in a hut-stable are made of cotton and measure 5.5 inches by 3.5 to 4 inches.